Mark Antoniewicz brings over ten years of public affairs and program management experience to the Hip Hop Caucus. He also brings a passion for connecting people to positive change, protecting the planet for future generations, and ensuring that the most vulnerable are at the forefront of policy solutions. Most recently, Mark was a political appointee in the White House Council on Environmental Quality, where he helped lead the external outreach portfolio on climate, environment, natural resource conservation, and energy. 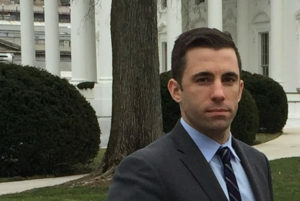 He served as a public affairs advisor to senior White House officials and worked to create opportunities to highlight policy impacts, engage new communities, and enhance collaborative relationships to build support for action. As a member of President Obama’s environmental team, he was involved in initiatives such as the Paris Climate Agreement and Clean Power Plan, efforts to ensure access to the clean energy economy and outdoors for all, and several National Monument designations to protect cultural and natural resources, including the first ever honoring LGBT history and Women’s rights, and millions of acres of land and water critical to local communities and wildlife. Prior to the White House, Mark served in the Office of Small & Disadvantaged Business at the United States Department of Transportation, where his team worked to ensure that the nation’s small, minority, women, and veteran-owned businesses had the opportunities and resources they needed to succeed within the transportation industry. Before joining the USDOT, Mark provided project management and organizational design support to senior executives within the federal government as a member of M Powered Strategies consulting firm. He began his career in Washington D.C. as an aide for former United States Senator from New Jersey, Frank R. Lautenberg. Mark lives in Washington D.C with his family and is active in community organizations that use basketball as a vehicle to improve lives. He is a proud native of Madison, Wisconsin, and earned a Bachelors Degree in Political Science from the University of Connecticut.